Yesterday, we (Coaches John and Mark) threw hay. 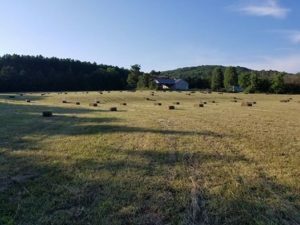 For the uninitiated, that means pulling 70# bales of hay out of the field, loading them on the trailer, taking them to the barn, and stacking them 7-8 bales high. Along for the ride was one of our 21 year old nephews. At ages 49 and 42 respectively, we each outworked the kid more than 2 to 1. How were we able to do that? Why are we able to outwork most everyone we know in a similar fashion? Our fitness. The same fitness we develop every day at … [Read more...] about Real Fitness. Real Work.